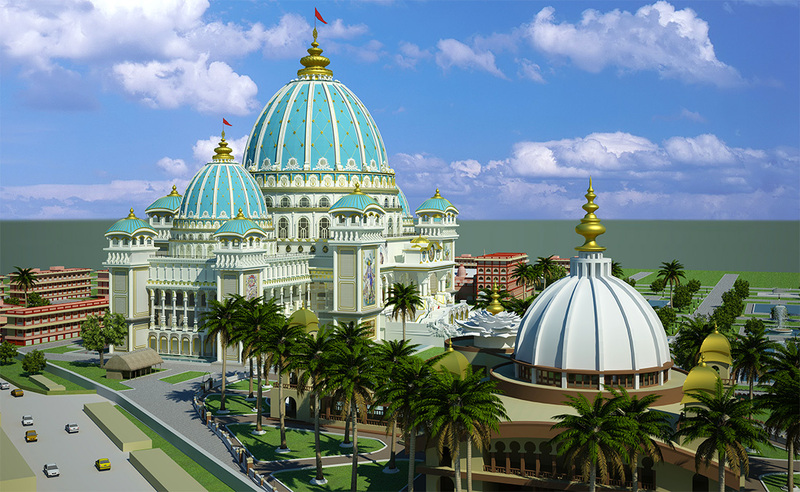 The temple is being designed according to the sacred architecture that has facilitated spiritual self-realisation for millions of people throughout the ages. Simply seeing the outside of the temple will evoke an appreciation, and awaken the dormant devotion for God in every sincere seeker. Moving inside the temple, the visitor will be astonished by the many informative displays of Vedic Art, Science and Culture. The centerpiece of the complex is the Vedic Planetarium which provides visitors with an enlivening tour of the various regions of the cosmic creation. Beginning from the lower planets, pilgrims travel up through the earthly realm and then on to the higher planetary systems before passing beyond the boundary of the material universe. Within the spiritual realm, visitors view the various spiritual planets, before finally arriving at the topmost spiritual abode of the Supreme Lord Sri Krishna. The Vedic Planetarium features a giant rotating model that demonstrates the movements of the planetary systems as described in sacred texts such as the Srimad-Bhagavatam. Explanations and displays are also presented that describe how these movements correspond to the visible universe of our experience. Journey beyond time and space, to a realm of full eternity, real knowledge and blissful spiritual pastimes – Welcome to the Temple of the Vedic Planetarium.